An Indonesian woman held two years on suspicion of killing the North Korean leader’s half-brother was freed from custody Monday after prosecutors unexpectedly dropped the murder charge against her. The two young women were accused of smearing VX nerve agent on Kim Jong-nam’s face in an airport terminal in Kuala Lumpur on Feb. 13, 2017. They have said they thought they were taking part in a prank for a TV show. They had been the only suspects in custody after four North Korean suspects fled the country the same morning Kim was killed. Prosecutor Iskandar Ahmad said the discharge not amounting to acquittal means Aisyah can be recharged but there are no such plans for now. Aisyah was quickly ushered out of the court building in an embassy car. Her lawyers said she is heading to the Indonesian Embassy and expected to fly to Jakarta soon. Huong’s murder trial was put on hold after the surprise development. She was to have begun giving her defence in Monday’s court session, after months of delay. Indonesian Ambassador Rusdi Kirana said he was thankful to the Malaysian government. “We believe she is not guilty,” he said. Huong’s lawyer, Hisyam Teh Poh Teik, said they will seek to postpone the trial. 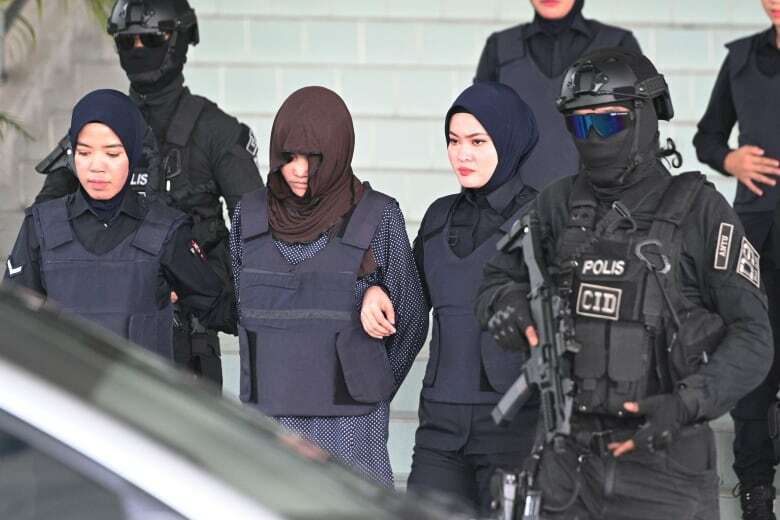 He said Huong was distraught and felt Aisyah’s discharge was unfair to her as the judge last year had found sufficient evidence to continue the murder trial against them. A High Court judge last August had found there was enough evidence to infer Aisyah, Huong and the four missing North Koreans had engaged in a “well-planned conspiracy” to kill Kim Jong-nam. The defence phase of the trial had been scheduled to start in January but was delayed until Monday. Salim Bashir, a lawyer for Huong, said previously she was prepared to testify under oath for her defence. “She is confident and ready to give her version of the story. It is completely different from what the prosecutors had painted. She was filming a prank and had no intention to kill or injure anyone,” he told the AP. Kevin Spacey faces indecent assault charge in U.S.